I have been applying BBQ sauce the wrong way for years! No kidding. I love the flavor BBQ sauce adds and the awesome crispy goodness, but I always make such a mess with a mop or brush that I had all but given up on it when cooking on the road. As everyone already knows, I HATE CLEANING! So BBQ sauce, especially dried on, was especially a pain in the...well you know. Until now! I found these little beauties at a closeout shop and they worked so well I went online to find more! It's not that often that I rave about a kitchen gizmo, but this one deserves some space on-board. Behold, the Silicone Screw-on BBQ Sauce Applicator! OK, so that's a lot of exclamation points for a really simple and inexpensive gadget. I know. But when something this simple works so well, it's easy to get excited. Now I have tried bottle-based basting brushes before -- they had thin plastic bristles and worked fine, but cleaning the sauce off of them was almost impossible. There was always some leftover sauce deep at the base of the bristles. Wasted too much water to bother with. This thing has thick silicone bristles that are easy to clean and apply the sauce evenly and easily. It's actually a very simple gadget. Open a bottle of your favorite sauce (or add your own sauce to a like-sized bottle), screw on the brush, invert the bottle, give a little squeeze and the sauce comes out a large hole in the center of the brush, "paint" on your sauce. That's it. Flip over the bottle to get the sauce back to the bottom and use the remaining sauce on the bristles to finish up. Waste not, want not! When done, simply flip the bottle back over and unscrew the brush. Don't forget to put the cap back on the bottle (Don't Ask!) and rinse the brush clean. No muss, no fuss and uses surprisingly little water to clean. What else could you want in a BBQ sauce applicator? You can also use it on Salad Dressings to apply to chicken or whatever. If it will screw on the bottle, it will work. Just be careful if the stuff you are applying is very thin liquid as it will just pour out! And that would just make a helluva mess. Not good at all. The whole contraption weighs about an ounce and isn't fragile at all, so storage is pretty easy. Make sure it's clean or critters will actually eat the bristles right off the brush. Do mice actually like the taste of silicone? I mean the red ones kind of look like strawberry licorice. Now I can baste and sauce whatever I like inside or outside on the grill while traveling. I am beginning to experiment with different brands and my own concoctions. If I hit on a good one, I'll share it with you all...maybe! Unfortunately, I live in a place where we have Winter. That means snow, ice, cold weather and most of all, changes in temperatures from below zero to above ninety degrees over the course of the year. This kind of a swing wreaks havoc with any house, let alone an RV. You see, water is evil. It can get into the smallest gaps and stay there. Add some below-zero weather and the water will freeze, expanding the gap further. Then when warmer weather comes and it all melts you see a tiny leak...but when it rains...oh boy, you have a real ingress of water. As always, locating where it's coming from is the toughest part. Here's a great place where an ounce of prevention is worth a ton of cure! Even small amounts of water over a long time can cause problems like mold, mildew and rot. See The My;ar Thermal Cover! So, what can you do about it? First start by making sure all the windows, doors and vent covers are closed. Especially on the roof. I know that sounds pretty obvious but often the roof vent covers don't close properly nor seal well. This should be checked BEFORE winter and attended to. It may just be an adhesive foam seal replacement or could be a full remove/replace of the offending vent itself. Pays to find out before it's too cold to repair! 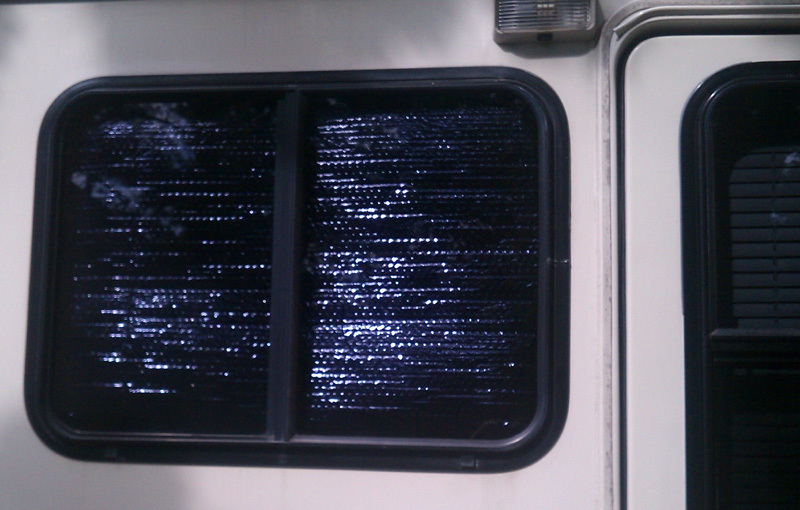 Believe me, you will NEVER be able to stop ALL the moisture from coming inside -- RV's aren't that airtight. Thankfully, since if they were and you were using propane it could become deadly! For the rest of the moisture (mostly to prevent mold and mildew) put at least one large dehumidifier inside. I use the crystal style. I like to check on the interior of the RV periodically throughout the winter months and can empty and refill the dehumidifier as needed. This will keep the humidity levels down to a manageable level. Around 55% average humidity is acceptable to keep the bad stuff at bay. Be aware that if you work in the RV in the winter months and run the furnace it will put moisture into the air, so you should ventilate the interior. Opening a side window about one inch or so will be fine. If it accumulates too much, it will condense on the glass and other interior surfaces when the outside temps are low and the interior is moist. Think of a glass of iced coffee in the summer...all that moisture collecting on the glass, dripping down to the table? Use a coaster! Simple, easy steps to make sure you don't walk into a nasty surprise come Spring. 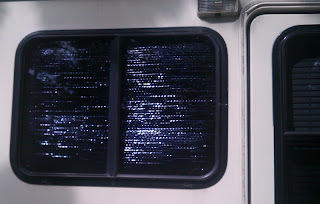 Last thing I would want to do is begin a lengthy water damage repair just when the RV season is getting underway. I'd rather be RV'ing...bet you would too! Taking Pictures - What's The Best Way To Do It...And Why! For the most part, I take "snapshots" for my articles. If I am performing some difficult or technical modification/repair, I take more detailed photos. They're not the best I can do and I know it! Last week I wrote about a new cellphone I bought and it got me thinking about how I take photos for my articles. No matter what they are for, your photos record moments you want to keep. For how long? Well, that's up to you. In any case, there are many ways to take photos and many devices you can use. Each has its pro's and con's. Figuring out what to use and how to compose your photos is really important. Here's how! A Great Camera In It's Day. Still Works! The Device. Nowadays, digital photos rule the day. It's increasingly rare to find someone taking pictures on actual film. Hopefully, we all remember or know what that is! I still take pictures using an older digital camera. It's a Sony CyberShot 10.1 megapixel one. Works fine, takes OK shots in a resolution that works fine for online use. The higher the resolution, the clearer the pictures when resized larger, however, the file size gets bigger and bigger! An average 1920x1080 (HD) photo is around 1MB with minimal compression. The more it's compressed, the smaller the file size, but you will give up some in quality. I shoot in a 3 mega pixel mode(2048x1536) so I can crop and manipulate the framing. Makes life easier when you take fast photos in awkward positions. Every week you see the results. 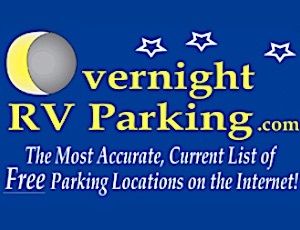 The problem is, I have to remember to bring the camera with me to the RV when I am writing an article or taking a trip. Sometimes I forget. That being said, I RARELY forget my cell phone. My old phone was capable of taking photos at 8 mega pixels but I always used less. The problem was ease of getting them to the articles. 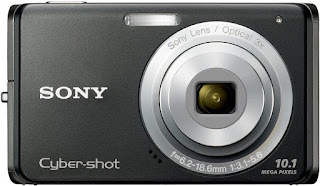 With the standalone camera, I pulled out the memory card, popped it into the reader and uploaded the pictures I needed. With the phone, I had to connect the phone to the computer (and deal with drivers and the like) and then navigate to the picture folder and copy each one across. Not all that efficient. Since I'm not much of a "cloud" guy, I like my files on my device, not floating about in cyberspace. My new phone has dual main cameras and a lower resolution camera on the screen side for video conferencing or "selfies." It also has a camera attachment that will take 360 degree spherical photos. That sounds way cool, but I'm not sure how great it will be for an article. The main cameras will take great photos and I've already connected the device to my home computer. That all works fine. What do I do if I want to access the photos for an article on one of my mini-android laptops I take with me when I travel? It's too hard to type up an article on a phone (even one with a bigger screen) and I haven't figured out how to connect the phone to the android tablet/laptop. It's not certain that I can anyway. Is it time to stop using the old standalone and switch to the phone's camera? It will take nice pictures and most of the time I will be able to easily integrate them into the articles. But....sometimes it could get difficult. Looks like there will be some experimentation. Stay Tuned.